Although blue foods exist, they're rare enough compared to other foods for food preparers to use blue plasters as a convention. The natural colour of a given food is due to pigments that have some biological origin. Is there any evolutionary reason why these are rarely blue? Blue color is not only rare in edible organisms - Blue color is rare in both the animal and plant Kingdoms in general. In animals, blue coloring is generated through structural optic light effects, and not through colored pigments. In the few blue-colored plants, the blue color is generated by blue pigment, namely anthocyanins. The reason for the scarcity of blue pigments remains unknown as far as I know. The vast majority of animals are incapable of making blue pigments, but the reason appears to be unknown, according to NPR. In fact, not one vertebrate is known to be able to. Even brilliantly blue peacock feathers or a blue eye, for example, don't contain blue pigment. Instead, they all rely on structural colors to appear blue. Structural colors are brought about by the physical properties of delicately arranged micro- and nanostructures. 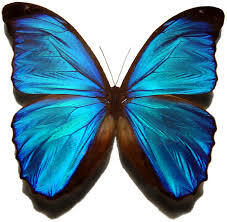 Blue morpho butterflies are a great example of a brilliant blue color brought about by structural colors. Morphos have a 6-inch wingspan — one side a dull brown and the other a vibrant, reflective blue. The butterflies have tiny transparent structures on the surface of their wings that scatter light in just the right way to make them appear a vibrant blue. But if you grind up the wings, the dust — robbed of its reflective prism structures — would just look gray or brown. Similarly, the poison dart frog is blue because of the iridiphores in its skin, which contain no pigment but instead feature mirror-like plates that scatter and reflect blue light (source: By Bio). Similarly, in the Kingdom of plants less than 10 percent of the 280,000 species of flowering plants produce blue flowers. In fact, there is no true blue pigment in plants and blue is even more rare in foliage than it is in flowers. Blue hues in plants are also generated by floral trickery with the common red anthocyanin pigments. Plants tweak, or modify, the red anthocyanin pigments to make blue flowers, including pH shifts and mixing of pigments, molecules and ions. These complicated alterations, combined with reflected light through the pigments, create the blue hue (source: Mother Nature Network). Although @AliceD's answer is a great simple demonstration of the paucity of blue in our natural world, there's likely a more nuanced/technical reason. Blue light was the most available wavelength of light for early plants growing underwater, which likely led to the initial development/evolution of chlorophyll-mediated photosytems still seen in modern plants. Blue light is the most available, most high-energy light that continues to reach plants, and therefore plants have no reason not to continue taking advantage of this abundant high energy light for photosynthesis. Different pigments absorb different wavelengths of light, so plants would ideally incorporate pigments that can absorb the most available light. This is the case as both chlorophyll a and b absorb primarily blue light. (Absorption of red light likely evolved once plants moved on land due to its higher efficiency). Pigments appear as whatever color is not absorbed (i.e, they appear as whichever wavelength(s) of light they reflect). Because blue pigment would reflect the majority of light that modern plants rely on for their chlorophyll-mediated photosystems, blue pigments remain scarce in plants. Photosynthetic organisms would not remain competitive if they failed to absorb the readily available, high-energy blue light, and so therefore evolution has likely very infrequently favored the generation (or propogaiton) of blue pigments. transmission is when electromagnetic energy is able to pass through the atmosphere and reach the surface. Visible light, largely passes (is transmitted) through the atmosphere. This means that blue and green light are the most available wavelengths of light. Note that blue/green are followed closely by the rest of the visible spectrum and NIR (near infrared). Also note that a large portion of ultraviolet is largely absorbed by atmospheric gases (primarily ozone), and therefore poorly transmitted. More energetic waves have shorter wavelengths while less energetic waves have longer wavelengths. 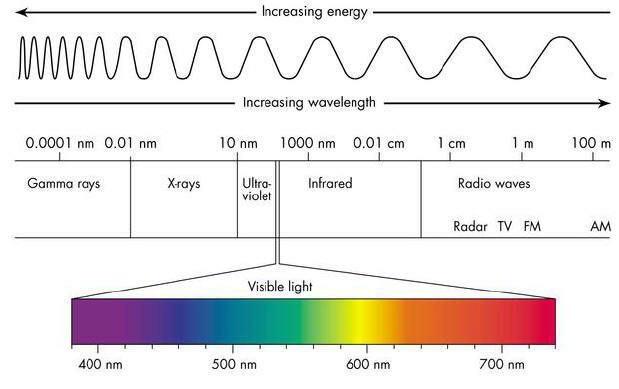 As a result, blue light (being the most available highest energy wavelength of light), seems to be the optimal wavelength of light for photosynthesis. Note that although available UV light is more energetic and can power photosynthesis, it's often a tad too energetic and can cause damage to cells. So it's often best for organisms to reflect UV. More info about the physics behind light energy can be found here. Photosynthesizing organisms contain pigments (typically heme/porphyrin-based chlorophylls and various carotenoids) that absorb light energy. Basically, the energy from a photon of light raises an absorbant pigment to a higher energy state (called an excited state), and then the pigment releases that unstable energy to return to it's ground state -- this excess energy is what powers the biochemical reactions of photosynthesis. See here for more details. As you can see, plants have evolved to have pigments that absorb primarily blue light (followed by red light). These pigments reflect green light and so therefore appear green. Presence of blue pigments (i.e., those that reflect highly abundant blue light), on the other hand, would be in direct contrast to these photosynthetic efforts. As a result, blue pigments remain rare in photosynthetic organisms powered primarily by chlorophyll-driven photosystems. However a number of sources (e.g., Mae et al. 2000, Brins et al. 2000, and here) suggest that although plants absorb more blue light than other wavelengths, the most efficient photosynthesis does not occur using blue light. Instead, red light results in the highest photosynthetic efficiency. One of the reasons that they (in this case Brins et al) found was that xanthophylls were dissipating the excess energy associated with blue light causing a rate decrease in blue-light photosynthesis. Chlorophyll a also absorbs light at discrete wavelengths shorter than 680 nm (see Figure 16-37b). Such absorption raises the molecule into one of several higher excited states, which decay within 10−12 seconds (1 picosecond, ps) to the first excited state P*, with loss of the extra energy as heat. Photochemical charge separation occurs only from the first excited state of the reaction-center chlorophyll a, P*. This means that the quantum yield — the amount of photosynthesis per absorbed photon — is the same for all wavelengths of visible light shorter than 680 nm. 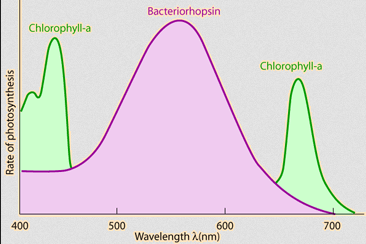 However, even at the maximum light intensity encountered by photosynthetic organisms (tropical noontime sun, ≈1.2 × 1020 photons/m2/s), each reaction-center chlorophyll a absorbs about one photon per second, which is not enough to support photosynthesis sufficient for the needs of the plant. To increase the efficiency of photosynthesis, especially at more typical light intensities, organisms utilize additional light-absorbing pigments. Photosynthesis increases linearly with light intensity at low intensity, but at higher intensity this is no longer the case (see Photosynthesis-irradiance curve). Above about 10,000 lux or ~100 watts/square meter the rate no longer increases. Thus, most plants can only utilize ~10% of full mid-day sunlight intensity. Blue and green light are the most available wavelengths of light. BUT plants don't necessarily need the high energy of blue light for efficient photosynthesis. So given all of that, the question still remains: why absorb mostly blue light and not green light? The answer, though still somewhat conjectural, is likely due to the light availability of early plants. Early plants evolved, like all life, under water. It turns out, just like the variability in transmittance of different wavelengths of light through the atmosphere, certain wavelengths of light are more capable of penetrating deeper depths of water. 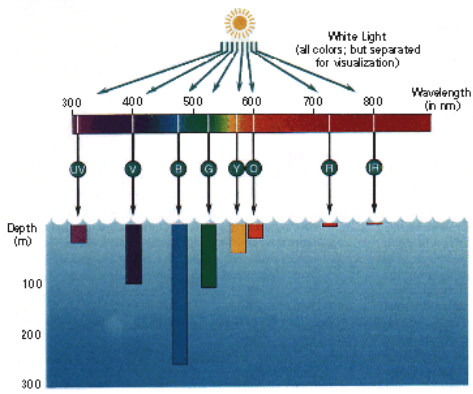 Blue light typically travels to deeper depths than all other visible wavelengths of light. Therefore, the earliest plants would have evolved to concentrate on absorbing this part of the EM spectrum. However, you'll notice that green light penetrates relatively deeply as well. The current understanding is that the earliest photosynthetic organisms were aquatic archaea, and (based on modern examples of these ancient organisms) these archaea used bacteriorhopsin to absorb most of the green light. Early plants grew below these purple bacteriorhopsin-producing prokaryotes and had to use whatever light they could get. As a result, the chlorophyll system developed in plants to use the light available to them. In other words, based on the deeper penetrative ability of blue/green light and the loss of the availability of green light to pelagic prokaryotes above, plants evolved a photosystem to absorb primarily in the blue spectrum because that was the light most available to them. So why have plants not evolved to use green light after moving/evolving on land? As stated above, plants are terribly inefficient and can't use all of the light available to them. As a result, there is likely no competitive advantage to evolve a drastically different photosystem (i.e., involving green-absorbing pigments). So earth's plants continue to absorb blue light and reflect the green, and blue pigmentation remain uncommon in our world. Plants likely evolved to produce anthocyanins (the pigments responsible for the reds/blues/purples attributed to blueberries and violets) for reasons other than photosynthesis -- e.g., attraction, UV protection, or even protection against herbivores. See here, here, and here for examples. So what about non-plant organisms? Carotenoids are the most common group of pigments found in nature, including in animals. Animals are incapable of making their own carotenoids and thus rely on plants for these pigments. In other words, most pigments in non-plant organisms originate either directly or biochemically from the organism's diet. Without direct ingestion of blue pigments, these chemicals are unavailable or biochemically expensive to produce (see Crustacyanin). 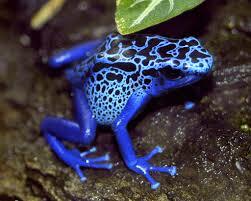 As a result, blue pigments are also uncommon in animals. Though, as AliceD's sources point out, we still don't fully understand why animals don't produce more blue pigments. It is not that there are no blue foods, it is that the English language does not like calling foods "blue". There are no natural borders between "colors" in a colorspace, all colors we name (and learn to distinguish) are culturally defined. So, an important thing to recognize is that, a color somebody calls "blue" can be called "purple", "red" or "maroon" or "green" or something else. With that in mind, we can take a look at foods. Animal foods on the inside are protein, and cooked protein is usually a pale greyish goo (although muscle cooked medium still has reddish coloring). One of the rare examples would be some eggs with blue shells. In plants, basically all leaves we eat are colored by chlorophyl. So they are out of the equation. Other plant parts, especially fruits, tend to be colored by one of a few other groups of pigments. And a major group of those pigments, the anthocyanins, ranges from blue to purple to red (they also change with pH). So a ton of foods have a somewhat purplish blue color, and are also named "blue" in other languages. Plums, aubergines, red grapes, red cabbage, and many berries are good examples for that. Then you have some plants which come in many colors, but the major cultivars happen to not be blue - potatoes and maize are the first to come to mind. Other shades of blue are less common just because they don't happen to be covered by the major pigment groups, but if you go down into shade level, then "royal blue" is just one of many on the spectrum which is missing. Also note that there are still plants which have other shades of blue and are consumed, they are just not commonly thought of as "food". Lavender, chicoree, gentian and pansies all have blue flowers of various shades and are traditionally used in recipes. So there is no special evolutionary reason why plants or animals should not be blue - many of them are blue, and we eat some of the blue ones. It is simply a cultural or linguistic trend for English speaking people to not see their food as blue. Not the answer you're looking for? Browse other questions tagged evolution molecular-biology food pigmentation or ask your own question. Why does so much variation exist within species?